The MFC-9440CN is a network-ready color laser Multi-Function Center that offers a wide range of standard features ideal for any office or business. Produce vibrant, rich color documents and copies in-house without having to outsource printing them. Fast color laser printing. 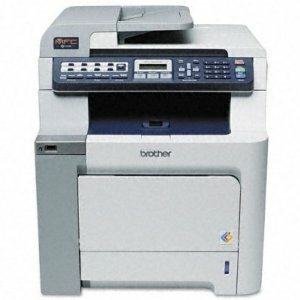 Delivers an impressive color and monochrome print speed of up to 21 pages per minute, and copy speeds of up to 17 copies per minute. Outstanding print quality. Produce brilliant, colorful presentations, brochures and documents that will give you a competitive edge. Versatile paper handling. A 250-sheet capacity paper tray adjustable for letter or legal paper and a 50-sheet multi-purpose tray for envelopes, labels, letterhead or cardstock. High quality color scanning. Use the letter size document glass to scan a single page or the 35-page capacity auto document feeder to scan multiple pages at a time (up to legal size). High-speed faxing. Send and receive faxes quickly in b & w or color using its high speed 33.6 K bps fax modem. Easily accessible USB Direct Interface. Conveniently print PDF or JPEG files from or scan PDF or JPEG files to a USB flash memory drive. You can also print directly from a PictBridge compatible digital camera. High capacity replacement toner cartridges . Lower your cost per page and copy, since you won't have to replace toner cartridges as often. Brother iPrint & Scan. Free app download for wireless printing (JPEG, PDF, web page & e-mail) and scanning to your Apple , Android or Windows Phone 7 (JPEG only) mobile device .